Posted November 19th, 2015 by admin & filed under Hand/Wrist. “My hands and fingers are so swollen, how do I get the swelling down?” This is one of the most common question that I get asked from people that have swelling after hand/wrist injuries or surgeries. First, let’s talk about what is swelling in hand? Swelling is the inflammatory process after an injury or surgery. There are three stages and can be different depending on the nature and degree of injury. The first part is what you initially see, the puffiness, looks like your hand got injected with water. It’s exactly that, water and some cells that your body produces due to the injury to fix itself. When the swelling is puffy like this, keep your hands elevated. You can hold your hand up when walking and rest it on a pillow when sitting or sleeping. Keep your hand slightly higher than the level of your elbow. You don’t need to constantly hold your arm up. If nothing happened to your elbow and shoulder make sure you are moving that so you don’t get stiff in areas that are not injured. Gentle motion is encouraged based on the type of injury. In the second phase of swelling is when the swelling persist and the body sends even more of these “cells” to that part of the injury. The swelling seems to get a little harder. I equate this to “dirty water”. The dirty water rushes in after the injury and sometimes as it subsides, it leaves the “dirt” which is like scarring but on the inside. It makes tissues thick, muscles and tendons short, and joints hard to move. 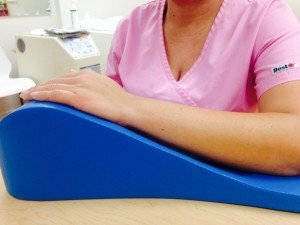 This part of the swelling can be the hardest part of therapy because it can be painful and the longer it persist, the stiffer the hand can become. You have to find the balance between enough exercise to help get rid of the swelling and reduce the stiffness, and overdoing it where you actually can increase the swelling, making the situation for the hand worst. The third phase is the chronic phase where the puffiness is gone and but swelling appears thick and hard. The scarring that has occurred in the inside is maturing and is slower to respond to the elevation. This phase can last a long time, like a couple of years long before all the swelling is completely gone. Besides keeping your hand elevated to help with reducing the swelling, using cold therapy can help as well to reduce swelling. I like my cold therapy to be very cold. I find that it is most effective when very cold but it does matter what you are able to tolerate. Using retrograde massage (Check out the video!! )– meaning applying a moderate amount of pressure to “push” the fluid out of your hand and back to your body can be helpful as well. Compression gloves, sleeves, and coban (self-adhesive wrap) wrap can help “press” the fluid out as well when sleeping or during the day during functional use of the arm. Have questions about your specific injury? Give us a call 786-615-9879! As always thank you for your support and feel free to SHARE! Hands on Therapy Services is a leading Miami certified hand therapist, specializing in swelling in hand rehabilitation of shoulder, elbow, wrist, and hand injuries resulting from injuries, surgery, or naturally occurring conditions. Our Miami hand therapy services are provided by our certified hand therapist in Miami. We also offer occupational therapy in Miami with our on site occupational therapist. Plus – coming soon – we will be offering physical therapy in Miami. Rotor cuff tears can be extremely pafinul and somewhat limiting. Some of them require surgery while others are able to mend on their own with a lot of rest. A lot of Dr’s disagree over the treatments and think that if you don’t intervene surgically the first time the cuff will always be unstable and eventually re-tear and need surgery then and the surgery will be harder and take the patient longer to heal due to the scar tissue of the first tear. This issue has a lot of controversy! You really need to see an orthopedic specialist who deals with sports injuries since that is the best person to deal with your specific injury. The amount of pain and the limited movement depends on how bad the tear is, where it is, how long it has been there, if it has kept tearing due to the physical therapy and a lot of other different things. Right now you are probably at the point where the movements that do cause you pain are about 5 to 6 on a pain scale but when it is in resting position it is about 3 or so. The limited movement will keep you from being a picher though so you will need to have it taken care of and quickly before the healing and the scar tissue issue is there. Best of luck to you. Thank you. I hope to blog weekly about therapy issues. Please subscribe to our newsletter if you would like to receive updates on the newest topics. Thanks! wonderful issues altogether, you just won a emblem new reader. What could you suggest about your publish that you just made some days ago? Any positive? Thank you. Please subscribe to our newsletter for he latest blog posts! Thank you for all of your effort on this web site. My mum delights in working on internet research and it is easy to see why. A lot of people notice all regarding the compelling form you create important steps by means of the web site and therefore improve participation from visitors about this issue then our favorite princess is undoubtedly studying a lot. Take advantage of the remaining portion of the year. Your doing a brilliant job. I was studying some of your posts on this website and I think this internet site is rattling informative ! Keep putting up. Thank you so much! We just posted the latest one on wound care and healing. Please subscribe to our newsletter as it will keep you updated with the latest information and stories.